Your horse digs halfway to China every time you tie him to the hitching post, put him in his stall or leave him on the wash rack. 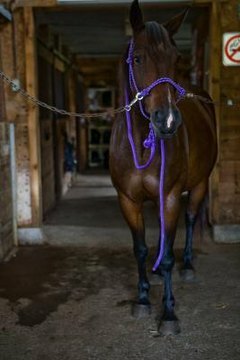 You've spent countless hours filling in the holes he's dug and trying to level the floor back out in his stall. Pawing is an annoying vice that, if left unchecked, can damage your barn and land, and it can even cause problems with your horse's hooves. Horses will develop all sorts of odd habits when they're bored, including pawing, cribbing and weaving. Pawing is often accidentally encouraged when a human gives the horse attention as a result of the behavior. Even negative attention in the form of a correction may be viewed as positive interaction by a bored horse with nothing better to do. Boredom pawing is best alleviated by finding the horse something else to do with his time, such as play with a stall toy, interact with another horse or graze. You may have accidentally taught your horse that if he paws, you come running. A horse will sometimes paw because he is stressed or impatient; for instance, your horse may paw while he is waiting for you to make it to his stall with his dinner. Since you come when he paws, he has trained himself to paw when he wants you to arrive faster. By showing up with the feed, you are reinforcing this behavior. When a horse is nervous or upset he may paw or demonstrate other anxiety-related behaviors. The behavior is reinforced if you go to him and try to comfort him, move him away from the source of his anxiety or otherwise devote special attention to giving him what he wants. A number of different solutions have been suggested and tried over the years to stop horses from pawing. Hobbles were once commonly used as a solution because they literally made it impossible for the horse to paw. Unfortunately, hobbles also made it difficult for the horse to move. Hobbles may be a solution in an emergency situation, if the behavior simply must be stopped immediately. It's more effective to train your horse not to paw than it is to try and block the behavior with artificial devices. Ignoring a pawing horse, refusing to feed or pay attention to a horse who is pawing and shifting the horse off balance every time he paws are possible ways to teach a horse gradually not to do it.